1. Referring to, relating to, effecting, or having the power of revision or making changes. 2. Concerning, or for the purpose of revision or making changes. 1. A variety show with topical sketches, songs, dancing, and comedians. 2. A musical variety show consisting of skits, dance routines, and songs that often satirize current events and personalities. 3. Etymology: "show, presenting a review of current events", from French revue, from Middle French reveue, literally, "survey, a reviewing, review"; from Latin revidere which came from re-, "again" + videre, "to see". Motto of Saint Mary of the Plains College, Dodge City, Kansas, USA. The red discoloration of a person's vision during an adaptation to darkness. 1. Visual perception of depth which is a result partly of binocular vision and because the visual stimuli transmitted from each eye goes to both brain hemispheres. 2. The perception of depth, distance, and three dimensionality arising from binocular vision. 3. Vision in which the visual fields of the two eyes are unified. Sensations from a common object received by the two eyes are superimposed, and as a result of the slight differences in the fields and the superimposition of the fields, the effects of depth and shape of the object are determined. 1. A section of an area or a part of something that is already broken up: The contractor's plan calls for the subdivision of the property into several building lots. 2. A section of something which is itself complete but is part of a larger composition: The sports section of Karl's newspaper has a large subdivision in it on the weekends for its numerous athletic fans. 3. The process, instance, or state of being detached into parts again following earlier separations: The subdivisions of the menu listings indicated that certain foods were prepared with nuts which was important for customers who might have allergies. Translation: "After viewing the body." A term used at a coroner's inquest of dead bodies. To oversee (a process, work, workers, etc.) during execution or performance; to superintend; to have the oversight and direction of an activity. The act, process, or function of overseeing: Supervision by Mr. Johnson was absolutely necessary while the students were in one room taking their tests because he had to make sure that they didn’t copy from each other! 2. In education, an official responsible for assisting teachers in the preparation of syllabuses, in devising teaching methods, etc., in a department of instruction; especially, in public schools. 3. In some U.S. states; the chief elected administrative officer of a township, who is often also a member of the governing board of the county. 1. Referring to, or having supervision or management by overseeing the performance or operation of a person or group: "He worked in a supervisory capacity." 2. Involving, or limited to supervision or the administration of people in work places. 3. Forming part of an operating system, which provides services for and controls the running of user programs. Closely observing someone; especially, a suspected criminal or a spy: Monroe didn't know it, but he was being surveilled by a government intelligence agency because he was thought to be involved in exporting arms to a foreign rebel group. 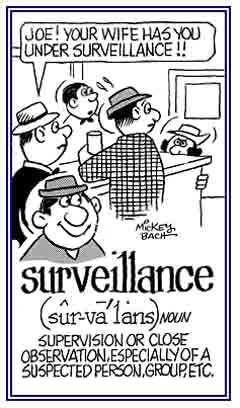 Although the following cartoon is for a noun, it still illustrates the meaning of this verb entry. 1. 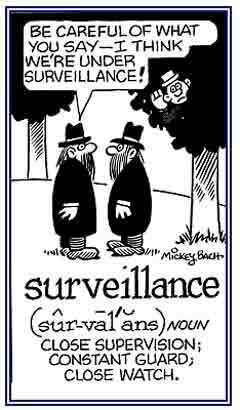 A constant observation of a person, or a group; especially, anyone who is suspected of doing something illegal or thought to be a potential miscreant: There are now several U.S. government agencies that provide surveillances of suspected terrorists. 2. The act of keeping a careful eye someone or something in order to detect or to prevent any kind of felonious act or to provide evidence of such actions: The surveillances provided by the bank's video cameras helped to identify the bank robbers. Electronic surveillances are being utilized by more cities around the world in order to apprehend lawbreakers who are involved in illegal activities. 3. 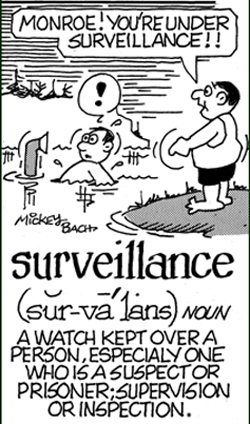 Etymology: from French surveillance, "oversight, supervision, a watch"; a noun of action from surveiller, "oversee, watch"; from sur-, "over" + veiller, "to watch" from Latin vigilare, from vigil, "watchful, awake, wakeful". © ALL rights are reserved. 1. A close observation; especially, of a suspected spy or transgressor: Although he was not aware of it, the criminal investigators had a surveillant on the man because there was an indication that he might be up to some kind of dangerous activity. 2. 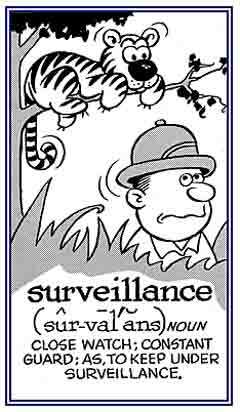 Etymology: from Latin sur, "over" + veiller, "watch" or vigilare, "to keep watch". Showing page 11 out of 19 pages of 276 main-word entries or main-word-entry groups.